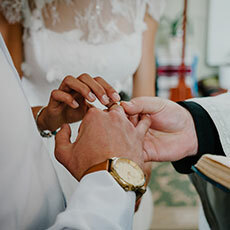 FOCCUS Facilitators can be marriage educators, clergy, pastors, lay individuals, mentor couples, counselors, or healthcare professionals who have been trained to use the FOCCUS© Pre-Marriage Inventory with couples. FOCCUS Facilitator Certification requires training, association with an approved organization, agreement with the appropriate use of the inventory, and online registration as a Facilitator. FOCCUS Facilitators are members of organizations that prepare couples for marriage. They meet privately with engaged couples several times prior to their marriage to help them celebrate their relationship strengths and communicate positively with each other about issues they may not have thoroughly addressed. As a couple prepares for marriage, the primary goal of facilitation is to help couples talk openly and respectfully to each other about topics that are important to lifelong healthy marriage satisfaction so they can apply that learning towards their future together. FOCCUS Facilitators are marriage educators, clergy, lay individuals, mentor couples, counselors, or healthcare professionals. A certified FOCCUS Facilitator attends and completes a facilitator training workshop, is registered on the FOCCUS Inc. USA website, and they are associated with an organization that is approved to administer FOCCUS. Note: The FOCCUS Pre-Marriage Inventory requires special training to administer so materials related to this inventory are sold only to certified FOCCUS Facilitators. All other materials, including the REFFOCUS Marriage Enrichment Inventory, can be purchased by any interested party.